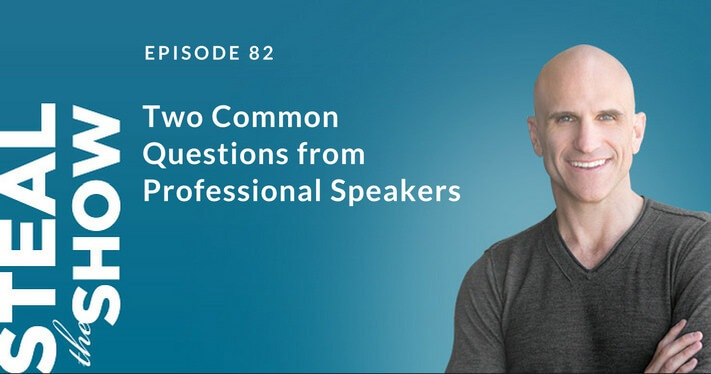 What if a company says: “You can only do this speech for our company,” or “We need your slides months before the event.” This episode answers these two questions from professional speakers. 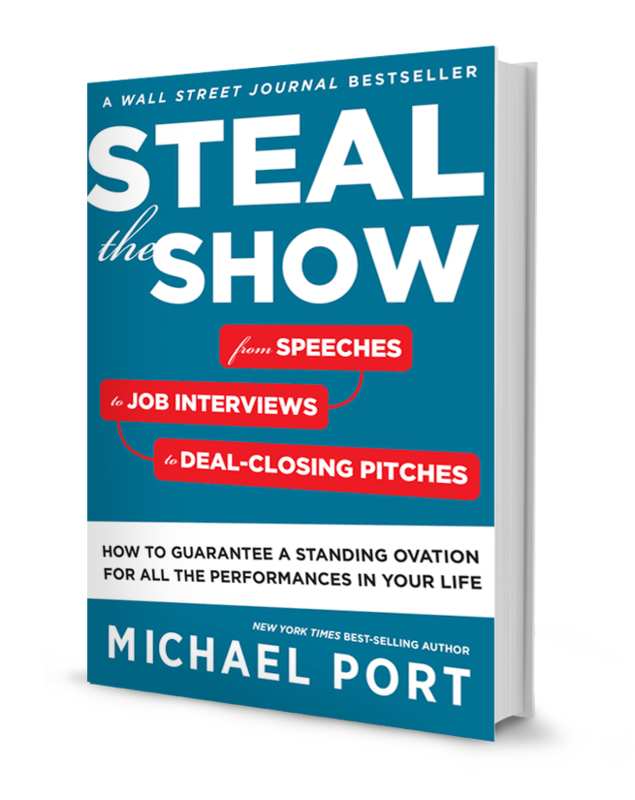 00:01 Michael Port: Welcome to Steal the Show with Michael Port. This is Michael. Today is a listener question day and I’m gonna answer two questions from Steal the Show listeners. But first a word from our sponsor. We’ve got two questions. First question is from Jenny in California. She says, “What if a company says ‘You can only do this speech for our company? '” So Jenny, I’m assuming you’ve been asked that question but maybe you haven’t, maybe it’s just a concern that they will ask that. It’s very, very rare that a company would make that request. Most companies, ones that have experience hiring speakers know that speakers don’t do speeches that are exclusive to a company. And they probably wouldn’t expect that or need that. What they do ask for however is customization. “We want to make sure that your speech is custom to our audience.” And that is a very legitimate question and it’s a question that you will get often. 01:17 Michael Port: Now that doesn’t mean that you rewrite an entire speech. It doesn’t mean you do a speech that you never do just for that one company. But what you do do is you customize your regular speech. So imagine it’s a stump speech, it’s the speech that you do regularly around the world. Now maybe there are certain modules inside that speech that you specifically leave for customization and maybe it takes you a few hours, a few weeks prior to the event to make those custom changes, and you work on those changes over the next coming weeks, so maybe you put in five hours probably plenty for those custom changes for that company. And then of course, that company feels taken care of, they feel respected, they feel that their money is well spent and they feel that the presentation was customized for them. In fact, often they feel the entire thing was custom if even just a few elements of that presentation are very customized. The other thing I would say is that sometimes we worry about things that have never happened because we are concerned we won’t know what to do when they occur. So it’s often good to get a lay of the landscape, like you’re doing here, asking this kind of question and getting an answer that will comfort you. And at the same time, sometimes we worry about things that have not yet happened unnecessarily. 03:01 Michael Port: For example, I spent about 20 years in martial arts and I had a wonderful teacher who was not a marketer at all. He was a very traditional teacher and the work was important and the marketing was not interesting in any way, shape, or form to him. And I mentioned off the cuff one day I said, “If you want a little help with that, because I know that you care deeply about bringing new students to the art, not about you making money but care about the students bringing more students into the dojo, I can certainly help you do that, couple months we could fill up this dojo.” And he said, “What if I get too many students? And I said, “Well, sensei, why don’t we worry about that when it happens because it’s not a problem you have right now, the problem you have right now is not enough students.” So sometimes we worry about things that have not yet happened and as a result we don’t do the things that we need to do, like work on the speech, go out and book more speaking gigs because we’re afraid of what might happen if we do and that we won’t be prepared for, we won’t know how to handle it. So that’s the first question. 04:25 Michael Port: Onto the second question. Second question is from Steven in Littlefield, Connecticut. “What if a company says they have to have your slides months in advance of the event?” What if a company says they have to have your slides months in advance of the event? That does happen. And most professional speakers will say no, not all but most, unless the slide deck you use never changes. So for example, in one of my keynotes, the visuals and audio that I use don’t change, they are exact. And that is not a speech that gets quote unquote customized. It doesn’t need to. It’s not about the company in particular. It’s about the people who work there. So it doesn’t need to be customized the way another presentation about, say, social media might. I don’t give presentations in social media, but if you do it might be custom for that audience to show that audience how they can do specific things with social media. 05:37 Michael Port: So I could deliver it in advance. But I may decide, because I’m constantly improving the work that I do, because it’s never done, it can always be better, I might decide I wanna make a change and then the presentation that I gave them would be different. And so you could say, “Well, sure.” You just give them the different presentation when you get there. The issue sometimes is that they build that presentation into their software and then they have trouble making the change, they don’t wanna make the change or they accidentally put the old one in and/or sometimes they can’t handle the technical elements. For whatever reason, their systems are set to a different slide ratio size wise than yours are. Maybe they have it set to 4:3 and that’s not the size that you use. So you can run into problems and what we find historically is that we run into more problems than you might imagine when giving slides in advance. 07:00 Michael Port: So generally what we say is, “No, I’ll bring my computer, bring my laptop, and we’ll use my laptop and we’ll connect it into your systems and we’ll be good to go.” If you are experienced, they generally don’t push back too much ’cause they know you know what you’re doing. If you’re not experienced, they may get a little bit nervous about it. So if you wanna walk them through the presentation, that’s fine. I have walked folks through a presentation and I have given them the visuals prior to a presentation, if they have a compliance issue. So if you’re talking to a financial services company, they may have compliance issues, and they need to see what you are gonna be presenting before you do. Or some companies need to make sure that there aren’t any brands represented in your visuals that would be in conflict, or a competitor, or some sort of brand that they don’t want featured at their event. Maybe it’s a competitor to one of their sponsors and they don’t want that. So I get it, I understand it. I may from time to time go over them via, say, go to webinar rather than just giving them over because one of the things that has happened for our first speakers is they’ll cut out slides, or they’ll make a change, or they’ll take the slides and put it on their own template and then the whole thing is thrown off and looks different. 08:25 Michael Port: And then that, then it raises the issue of the template. Sometimes these conferences will have a template and it has their logo on the bottom, and they want you to use their template and my answer is always no. Because what they see on the screen is part of the performance and if I’m now putting all of these materials into another template it’s gonna throw that off. So I say, “No.” And most of the time, they get it. I did have a conference organizer say to me once… Well, when she booked me, I told her I don’t use slides, ’cause I actually often don’t when I… I don’t really, when I do, book yourself solid. And the presentation I mentioned earlier where I do use audio and visual is ‘The Think Big Revolution’ and it feels more like a show than, say, how-to keynote. And so there are a lot of visual elements and there are a fair number of audio elements. So when I do that, I require a longer amount of time for tech rehearsal because the tech team needs to understand exactly what is necessary to make that work like a show. 09:43 Michael Port: But this woman who booked me was aware that I was not planning on using slides. And then two weeks before the event, she said, “Can you send me your slides?” I said, “Oh, but in my contract, it’s clear, I’m not using slides and we had discussed that. In fact, the videos you saw about… The videos you saw of me giving the speech did not have any slides in it.” She said, “Yeah, I know but someone else on the board said that ‘All good presentations have slides,’ so they want you to have slides.” I said, “Well, I’m not sure where they got that from but I’m not gonna use slides.” And she said, “Well, okay, let me go back.” So she went back and created a hullabaloo apparently and she came back, “So you have to have slides. That’s the deal.” I said, “Well, listen, can you get me on the phone with this person who’s concerned about it?” And she did. And we had a conversation and they just had this idea that slides were required and necessary ’cause they saw someone give a presentation without slides that was boring once. 11:53 Michael Port: And I think you probably know where the story is going. It turned out quite well. And she said, “Oh my God, I didn’t know that you could actually hold an audience’s attention without slides.” I said, “Of course, you can.” And part of this is a demonstration of how well-prepared you are and how comfortable you are with the choices that you’ve made, and have you made strong choices, because what you choose to do visually is gonna influence your presentation. And if you decide to use visuals, then it’s probably a good idea to know exactly why you’ve chosen to use them, have made sure that they make the presentation better than it would be if you didn’t have them. And then, if it ever comes up, if the issue ever comes up about using slides or not using the slides, you have a really good strong platform to stand on with respect to the choices you made. 13:07 Michael Port: Now, if you do use visuals and they say, “Well, you can’t use any visuals,” for whatever reason, can you still give that speech? And if the answer is no, then I would suggest working on the speech in such a way that you could give that speech without visuals because you will find that you’ll go give a speech somewhere and there’ll be a technical issue that will shut down the visuals, or freeze the visuals, or they’ll put up the wrong visuals, that happens. Then that’s again one of the reasons that you don’t give over your slides ’cause I’ve seen presentations where the wrong slides were put up, somebody else’s slides were put up and it creates a problem at the beginning of a speech and you do not want that kind of problem at the beginning of the speech. 15:24 Michael Port: And I found that funny because that should be par, that should be an absolute minimum requirement, not something that I should get a pat on the back for. But in the industry, the bar is actually not that high, honestly. The bar is actually not that high. People don’t expect that much from their speakers because what they typically see isn’t that impressive. And I’m not being critical here, I’m just looking at the industry and making an assessment based on the years that I’m in it. I think that most speakers can be better than they are. Either they overestimate their skill when they have not done much training, but they overestimate their skill because they’re very good at what they do off the stage, so their expertise is significant. So they figure, well if they’re expert at what they do and if they’re clever and charming, then they can get up on the stage and wing it. And they can definitely get away with it and they’ll often get praised, but they know they can be better. 16:34 Michael Port: Or people don’t really know exactly how to rehearse and prepare for a presentation, so they procrastinate often and then put some slides together and then use that as an outline and a cue card system for themselves to remember what comes next and then they just speak on extemporaneously about what comes next, much like I’m doing here. But a podcast, quick Q&A episode, is very different in my mind than a keynote in front of hundreds or thousands of people when it’s just you on the stage and they’re sitting in that auditorium or that theater and they can’t go anywhere. They are there. The only thing they do is walk out. And to walk out, they have to really be disappointed with what they’re seeing. So with you, the podcast, you can fast forward, you can stop and go onto something else, you can go to a different episode. You can’t be seen so you have more choice with respect to how you consume that content. Yeah, that’s my excuse for speaking extemporaneously. But I’m serious, it’s true. This is a little bit of a different format. 17:55 Michael Port: So those are the answers to the two questions. The first question was, what if a company says you can only do this speech for our company? Then the second question was, what if a company says they have to have your slides months in advance of the event? And I hope I answered both those questions for you. If you have any more questions, send them in to questions at heroicpublicspeaking.com, questions at heroicpublicspeaking.com. And this would be a good place where I put another sponsor bit. I could put in a little sponsor bit that says, “I want to thank my sponsor” so maybe we’ll put one in there. Then I’ll come back right after I do that. 18:40 Michael Port: So thanks so much for spending this time with me. I never take it for granted. Your attention means the world to me. I hope I continue to deliver value for you. I get up every day to do that. And until I connect with you next time, keep thinking big about who you are and what you offer the world. I love you very much, not in a weird way, but because you are somebody who cares about performance so that you can stand in the service of others as you stand in the service of your destiny. That’s it for today. Bye for now.